One of the best parts of this trip is connecting with misplaced friends and lost family scattered across this broad country. Our visit to Northern California allowed me to reconnect with my cousin, Kate, the daughter of my mother’s late brother, and sister of Mike, who we had a chance to see again in Mississippi. We had been messaging each other for quite a while, and it gave us another reason to be excited about our short visit to Northern California. We arrived early and signed in at the historic Sir Francis Drake Hotel in San Francisco’s Union Square. The hotel was built in 1928 and has been recently modernized. It maintains its celebrated opulence from the ever-present and colorfully-dressed Beefeater doorman to the grand staircase that leads to the gilded lobby. The hotel has been a noted favorite of many politicians, athletes and other celebrities through the years, and its revitalization is great to see. After settling in for a bit, we met Kate and her adorable dog Stella in the lobby. From the hotel, we had a two-hour drive into wine country which gave us plenty of time to catch up on the last decade and share the best news and newest gossip. We couldn’t have asked for a better tour guide for the day, you see Kate is a sommelier, and long-time restaurant manager who knows her way around wine country, and a charcuterie connoisseur which let us sit back and enjoy her company without worry of what was next. Our first stop was Oakville Grocery in Healdsburg’s historic downtown square. Healdsburg is referred to as the “epicenter” of the Sonoma county wine experience and the grocery’s inviting, covered patio gave shelter from the wind as we sat down to a nice lunch, two wonderful salads and a great bottle of Pinot Grigio. After lunch we took a short walk around the square to stretch Stella’s leg and work off the Pinot buzz, but mainly just to talk and enjoy the company – which we did. From there, we meandered our way down Dry Creek Road to the Seghesio Family Winery, founded in 1895 by Edoardo Seghesio and his wife Angela. Today, eight Seghesio family members from three of the five generations remain involved in day-to-day operations. Then it was on to the newer Dry Creek Vineyard, which was founded in 1972 by David Stare and today produces nearly 125,000 cases of wine annually. The winery is well-known for some of the best Fume Blancs in the valley – while I have NO idea what that means, it tasted pretty good. Finally, we headed back to Healdsburg and Bistro Ralph in the downtown area for yet some more food, more wine and more great conversation. It was a fun day, a wonderful reconnection of a family tie, and even better, a great new friendship! Thanks Kate for such a great time!!! 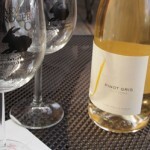 Want more information on the Sonoma Wine Road – click here.